Can't tell you all how long I've been waiting to name a post Raspeberry Beret. I mean come on, I have a beret collection but no raspberry colored one to honor the classic Prince song?! My heart burst into a million pieces when I saw this at the thrift store. Finally have my raspberry beret! These pictures are great - I love that skirt a whole lot! And that beret is great - I love the subtle detail; so pretty! I'm sorry that you had to sell your VW Bug! I love that kind of car and hope to own one some day. Oh and I really like your raspberry beret. The color is so pretty! This outfit is so edgy and girly at the same time! totally loving it! Ah that beret is such a pretty colour! The snow looks so beautiful! Haha yay for finding a raspberry beret. Love your leather jacket. I used to have a vw beetle too and i'd have to take it into the shop quite often and my cousin had the same problem with hers. As cute as they are, I'm beginning to think those cars are no good. I love that beret, it's such a gorgeous color. Also, you look fantastic! I have on beret, and it's black. I thought about getting a mustard yellow one I saw in Goodwill, but I didn't want to pay the $7 price tag they had for it. You look like an absolute doll in this look! The socks with the skirt and beret is a perfect combo, and the jacket pulls it together. You and your darling berets!!! You are always the picture of perfection Lauren...and this outfit is no exception :-) I swear my neighbors think I'm crazy too! Last time I went out in my backyard to snap pics...the lady two houses down started asking me question after question (yelling this to me of course)...so so awkward! 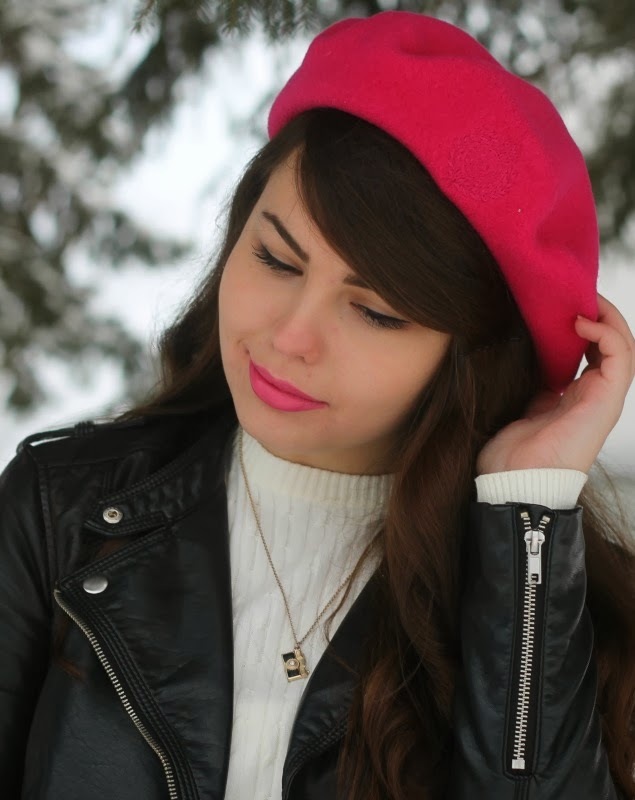 You always have the cuuuuutest accessories- and this beret is no exception! I love it!! 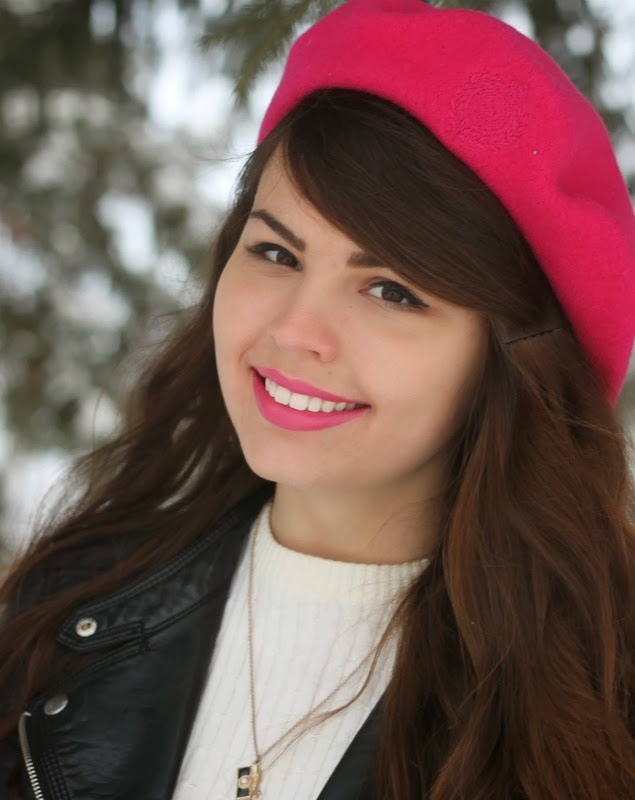 This beret is the perfect color! I absolutely love the pop of color it adds to this outfit. Your leather jacket seriously looks good with everything too. I really love it over that classic white sweater. cool jacket, i love this rivet!